Looking for a new book? Here are some of my recent favorites--a blend of chick lit and literary fiction, depending on your mood. ​Carousel Beach by Orly Konig is a tender and heartfelt novel that explores loss, the magic of childhood, and the possibility of second chances. Maya Brice is still reeling from a personal tragedy, pulling away from her friends, family, and husband. She’s buried herself in her work restoring an old carousel, spending long days in her studio lovingly bringing the animals back to their former glory. While working on the carousel, Maya makes a discovery that leads her to Hank, an elderly man living in a nearby nursing home, whose past is linked to Maya’s. As she becomes closer to Hank and the secrets he’s been keeping, Maya must decide if she’s going to hold on to regret or move forward. Told with humor, heart, a little romance, and a keen ear for dialogue, Carousel Beach kept me turning the pages to find out where Maya’s story would lead. ​Everything Here is Beautiful, Mira T. Lee’s emotionally gripping debut, explores the long-term and far-reaching impact of mental illness. Lucia and Miranda are sisters, bound closer by the death of their mother. For most of their lives, Miranda has been her younger sister’s protector, yet she is unable to shield her from the devastating effects of mental illness. Lucia, unwilling to face the reality of her bipolar disorder and possible schizophrenia, forges ahead with life and love, marrying first a gregarious older man and then leaving him abruptly for a younger Ecuadorian man, with whom she has a child. Both of these men, despite their best intentions and love for Lucia, are unable to understand her illness or keep her safe from it, and it is Miranda who is repeatedly called upon to rescue her sister and help to stabilize her. Spanning decades and continents, Everything Here is Beautiful sensitively examines Lucia’s nearly impossible quest to create a life for herself and her young daughter despite insurmountable odds. Seeking a life of meaning and beauty, she is unwilling to bend to anyone else’s ideas of what that looks like, though the stakes only grow higher each time she gets sick. Through powerful and haunting prose, Lee does an exquisite job depicting the complexity of both Lucia and Miranda’s roles and the difficulty of their choices. Mira T. Lee is a writer to watch, and I look forward to reading more by this author. I won’t lie, this devastating books can be hard to read at times for the subject matter is grim. It follows the story of thirteen year-old JoJo who accompanies his drug addicted mother to pick up his father who’s being released from prison. JoJo’s father is white and his mother is black, and the novel is also about the intense racism and brutality that persists. The reader also learns the haunting history of Parchman prison in Mississippi, where a twelve year-old could be sentenced to several year of hard manual labor for stealing food to feed his starving siblings. Yet despite its difficult subject matter, the characters and their story are gripping. Ward writes in raw and lyrical prose that lingered in my head long after I put the book down. When Tabitha's husband leaves her suddenly, without a word or explanation, she works hard to keep the truth from everyone, including her children and closest friends. Without a way to support herself, Tabitha struggles to put food on the table or pay for even the most basic necessities, yet she's unable to ask for help, terrified by the threat her husband hurled at her right before he left--"I'll tell them what you did." With shades of Maria Semple’s Today Will be Different, Not Perfect by Elizabeth LaBan is a humorous and poignant portrayal of how to cope—and rise—when life throws the unexpected. The Leavers, by Lisa Ko, tells the story of Deming, AKA Daniel Wilkinson, a Chinese-American boy whose mother disappears when he’s only ten years old. When no one is able to track down his mother, Deming is adopted by a well-meaning couple who move him from the Bronx to a small town in upstate New York. Ten years later, Deming has the chance to find out what really happened to his mother all those years ago, but he’s not so sure he wants to know. Full of rich language and powerful questions about home, this is a harrowing and devastating debut. Little Fire Everywhere by Celeste Ng is another atmospheric page-turner. Set in the community of Shaker Heights during the 90s, it explores the relationship between the members of the Richardson family whose world is rocked when an enigmatic artist and her teenage daughter move to town. If you liked Ng’s debut, Everything I Never Told You, you’ll love her latest. Megan Abbot has a talent for dropping her readers into eerie and unsettling worlds with characters who anything but simple. In You Will Know Me, we explore one family who has sacrificed everything to help their daughter excel in the competitive landscape of elite gymnastics. As the stakes get higher, how far are they willing to go to help her accomplish this dream—and just whose dream is it anyway? Amulya Malladi’s latest book, The Copenhagen Affair is both a fun romp through the streets of Copenhagen and a serious mediation on marriage, fidelity, and depression. In the aftermath of a nervous breakdown, Sanya and her husband Harry move to Copenhagen for a year. Harry’s company is in the middle of acquiring a new company, and Sanya is just beginning to emerge from the haze of depression. When Sanya meets Anders Ravn, one of her husband’s new business associates, she begins to feel things she hasn’t experienced in years. As Sanya and Ravn grow closer, she must face the way she has been living her life and the marriage she and Harry have created. Malladi’s writing is sharp, irreverent, and fast-paced, and she keeps the reader guessing at every turn about where Sanya will end up. While the peripheral characters are humorously self-indulgent and shallow, there is real heart at the center of the book as Sanya grapples with who she is as she battles her way through depression and who she may be on the other side of it. The novel also tackles the thorny subject of the distance that can grow within a marriage, the impact of infidelity, and if a marriage can survive betrayals small and large. In her acknowledgments, Malladi writes that the novel is her love letter to Copenhagen, a city in which she lived for over a decade. Much of the novel is about the city, and one will be hard-pressed not to want to go for a visit—or even a year—after finishing the book. The Copenhagen Affair left me laughing, reflecting, and eager to read more of Malladi’s work. ​Small Admissions, by Amy Poeppel, is a quirky and humorous story about friendship, love, and rejection. When Kate's French boyfriend breaks up with her suddenly, she falls apart, succumbing to a year-long depression on her couch in sweatpants. When she gets a job working in the admissions department of an elite private school, things finally seem to be looking up for her. Yet those closest to her remain unable to see how well she is doing, too focused on their own version of Kate. Told through a mix of traditional narration and letters, emails, student essays and other forms of amusing correspondence, Small Admissions is a fun and fast-paced read. ​Sisters One, Two, Three by Nancy Star is a beautifully written family drama about loss, parenthood, and sisters--and it also happens to be a page turner. Shifting between the past and the present, the novel tells the story of the Tangle family and is narrated by Ginger, the oldest of her four siblings. Early in the novel Ginger reluctantly reveals to her teenaged daughter that she is not one of two children in her family, but four. Ginger's brother died when they were children and she has no idea where her other sister is. The reader is then transported to a fateful summer over twenty years earlier when the family vacationed on Martha's Vineyard. What happened that summer to Ginger's brother Charlie and her relationship with Callie is slowly revealed. As Ginger struggles to make sense of what happened to her original family, she is forced to confront her relationship with her own daughter and Ginger's role in driving her away. While Sisters One, Two, Three is about a devastating topic--the loss of a child--it is also full of humor, suspense, love, and the intricacies of family dynamics. Star beautifully captures the enchantment of summer on Martha's Vineyard through coupled with Ginger's confusion of her fractured family, all seen through a child's eyes. I'm looking forward to reading more by this author. Saints for All Occasions, J. Courtney Sullivan's latest novel, is a layered family saga that tells the story of the Rafferty family. The novel opens when Nora Flynn learns that her oldest son has been killed in a car accident. Cutting back and forth between the past and the present and switching between narrators, we learn the shared history of sisters Nora and Theresa Flynn who emigrated from Ireland during the 1950s. Arriving in Boston, they're quickly absorbed into Nora's fiance's large family. For their whole lives, Nora has protected Theresa, her younger and more carefree sister. When Theresa's thirst for a different kind of life backfires on her, Nora and the next generation will feel its impact. The story is narrated by both Nora and Theresa, as well as Nora's adult children, all of whom have a complicated relationship with their mother and brother. Told with big-hearted generosity for its characters and without offering any easy answers, Sullivan's latest novel immediately transports the reader to the world she's created and captivates us until the last page. In Lucky You by Erika Carter, three sort-of friends Ellie, Chloe and Rachel, find themselves thrown together in a rambling house in the middle-of-nowhere-Arkansas. Chloe has come to escape an impending mental breakdown and Ellie has come to escape alcoholism and her tendency toward self-destructive sexual encounters. Rachel has latched onto her latest boyfriend's "Project," a commune-style quest for health (whatever that means). Yet as each of the three women get sucked into isolation and despair, their physical and mental well-being deteriorates dramatically, even as they try to keep believing in the plan. And since no other plan has presented itself, there's little choice but to continue what they're doing--smoking too much weed, sleeping all day, barely eating, and not interacting with the outside world. Lucky You is a dark and cynical examination of female relationship, mental illness, self-absorption, self-destruction, and the post-college years. The characters are complex if unreachable and at turns relatable and unlikeable. Though I often felt the need to escape the hellish confines of the world these characters have created, I also found myself drawn back in and unable to put the book down. A layered and eerie novel that I finished quickly but found myself thinking about for days, Lucky You is an assured debut. 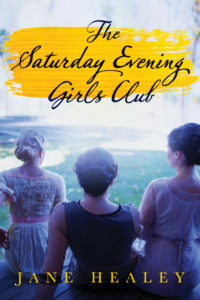 The Saturday Evening Girls Club by Jane Healey is an honest and heartfelt debut that realistically depicts the lives of four young women growing up in Boston in the early 1900s. The novel is narrated by Caprice, who longs to open her own hat shop in the North End but faces the expectations of her old-world Italian parents. Her three closest friends each face an array of challenges, including poverty, classism and racism, arranged marriage, and their own dreams for themselves that is often at odds with the ambitions of their families. Bringing these four friends together is their weekly time together at the Saturday Evening Girls Club. The novel read easily, and I was quickly drawn into the lives of these women. The characters are relatable and distinct, feisty yet believable in the way they both challenge and conform to the expectations of society and their families. I'm looking forward to Jane Healey's next book. Jessica Strawser's debut, Almost Missed You, is a twisty, turning psychological thriller and meditation on motherhood, romantic love, and fate. When Violet goes on vacation with her husband Finn and their young son Bear, she's happy and overwhelmed with her good fortune. When she returns to her hotel room after a few precious moments alone, she's stunned to find that Finn has left her in Florida--taking Bear with him. Finn lands on the doorstep of his oldest friend, Caitlin, also Violet's best friend. When Finn blackmails Caitlin into helping him hide, she sets out to find a way to make things right, putting all of them in danger. Told through alternating points of view, this novel reveals the tragedy that ultimately formed the basis for Violet and Finn's relationship and how it's possible to miss the truth that's right in front of you. Strawser's writing keeps the reader turning pages and eager to find out the lengths each character will go to protect what s/he holds dear. All three characters are all well-developed, likable yet flawed, and relatable. Jessica Strawser is a writer to watch--I'm looking forward to her next book. Annie Hartnett's debut, Rabbit Cake, is a quirky, original, and poignant story of 10 year-old Elvis Babbit as she tries to make sense of her mother's sudden death. Elvis's mother was a sleepwalker, and at the beginning of the novel, Elvis and her family are reeling from her death by drowning while sleep-swimming. Elvis's older sister is also a sleepwalker, though Lizzy is prone to potentially more violent and destructive acts in her sleep (and while awake). Elvis seeks solace and comfort in the animals she researches and gets to know through her time volunteering at the local zoo. As Elvis tries to unlock the mysterious circumstances of her mother's death and wrestles with her relationship with her volatile older sister, she learns tough lessons about love and loss. Hartnett's writing is sharp and humorous while also moving. She doesn't offer any easy solutions for Elvis and the people around her. The adults Elvis turns to to make sense of her loss are both imperfect and well-meaning. Elvis's observations of the animals she's so knowledgeable about are both metaphorical and fascinating. I thoroughly enjoyed I Liked My Life by Abby Fabiaschi. It's written from multiple perspectives, including a mother who has recently committed suicide. Maddy looks on from the afterlife and tries to pull the strings as her husband and daughter try to move on without, all the while grappling with what led her to take her own life. Despite the emotional nature of the subject matter, Fabiaschi's writing is sharp, funny, and never overly sentimental. With clearly drawn characters and a little bit of mystery, this one kept me turning the pages till the end. Leaving Lucy Pear is a languorous and layered novel that weaves together several stories all set in the Gloucester area of Massachusetts. The two female protaganists (three, if you count young Lucy) are all nuanced and complex. Both Emma and Bea are flawed and difficult at times, but each possesses an inner strength that makes the reader keep rooting for them. Beautiful writing that isn't fast-paced but kept me turning the pages, wanting to find out what will happen to Lucy Pear and the women that love her.